@ndelc: You assume SJ will be there. Might be PS. This will be followed b a thunderous litany of “WTF??? we spent millions in R&D to beat Apple wrt. a video player!!! !” by competitos who were hellbent on putting out a video player first. Spike in heavy alcohol consumption will follow and, to a lesser extent, firings and ledge-jumping. I want the option to buy individual chapters from these movies at 0.99 each! Matt, you’re right, although It’s pretty rare for SJ not to be at these types of events. If SJ isn’t there, I think that will start the rumor mills going all over again. I’m hoping for the living room device, something that will bring all media for the Mac front row style to the home theater of your choice. iPod update I could take or leave, it’s for music at my household. The movie store I could mostly take or leave, except Daddy (and Mommy occasionally) might likee an adult section to peruse. Sorry iCrystal, it’s the truth. I say new software similar to iTunes but for movie rentals ($3.99 5-days, $4.99 new releases) and purchases ($9.99 and $14.99). Look at the left column of your iTunes: there’s too much already (radio, podcasts etc…). It is full. Plus the way we watch videos in iTunes right now is just not convenient. iTunes should be for music only. 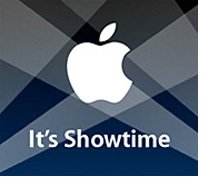 The name of the software will be… “SHOWTIME”. Can’t wait to see that !